Panathinaikos Athens edged Real Madrid 73-74 at the Community of Madrid Sports Palace on Thursday for a crucial victory that puts the Greens on the verge of qualifying to the Turkish Airlines Euroleague Playoffs. The win lifted Panathinaikos to 8-4 in fourth place of Group E, and it leaves it with a chance to grab a home-court advantage in the playoffs as well. 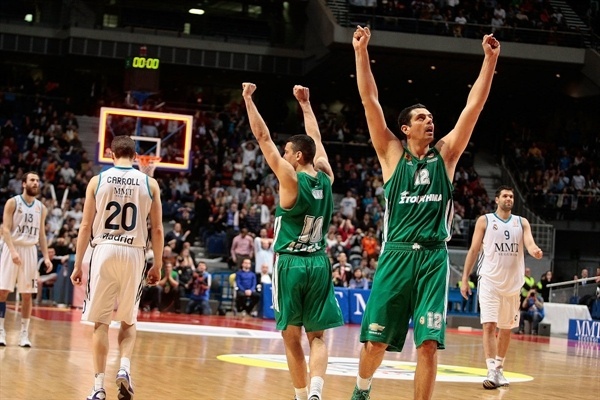 Meanwhile, Madrid qualified for the playoffs despite the loss, due to CSKA Moscow beating Unicaja Malaga earlier. However Real Madrid dropped to 9-3 and now is in a three-way tie for first place in the group with CSKA Moscow and Anadolu Efes. The clash between the two Euroleague powers was close throughout, with neither team holding a lead larger than 7 points at any time. The Greens used triples from Jonas Maciulis and Dimitris Diamantidis to make a key 0-8 run late in the fourth quarter for a 63-66 advantage, and they took the lead for good despite some bad free throw shooting in the final seconds. Kostas Tsartsaris led the way with 16 points. 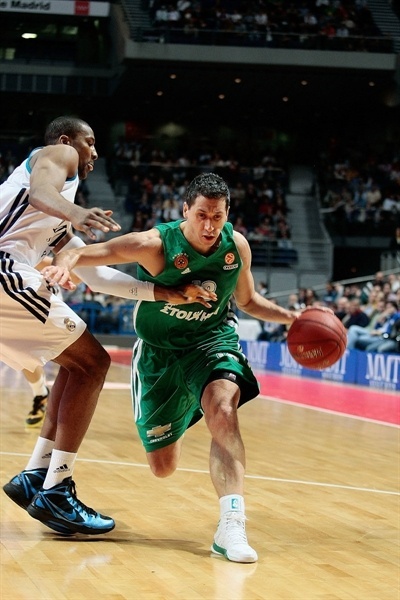 Diamantidis finished with 14 plus 8 assists, Roko Ukic had 12 points and 6 rebounds, while Stephane Lasme chipped in with 10 points. 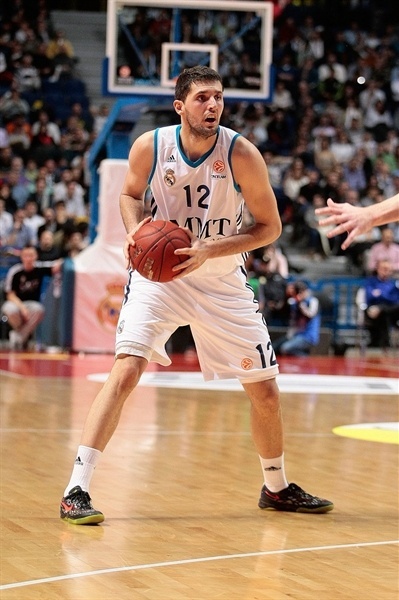 For Madrid, Nikola Mirotic and Rudy Fernandez each scored 17 points and Sergio Rodriguez finished with 10 in defeat. Back in the starting lineup after missing last week's game, Fernandez got the hosts going early, making back-to-back steals for uncontested fastbreak baskets, then assisting Mirza Begic for a layup-plus-foul and a 7-2 lead. 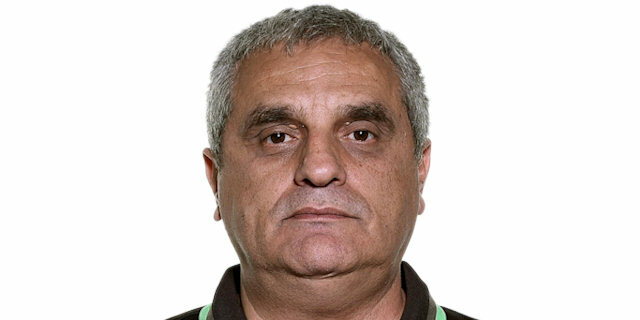 Gaios Skordilis was the one who, in the meantime, opened Panathinaikos' account, before James Gist and Lasme added baskets inside. While the hosts added to their tally from the foul line for 12-8, a jumper from Ukic started a 0-9 run that also included a dunk from Lasme, a driving layup from Diamantidis, and was capped with an Ukic triple as Panathinaikos took a 14-17 lead after 10 minutes. 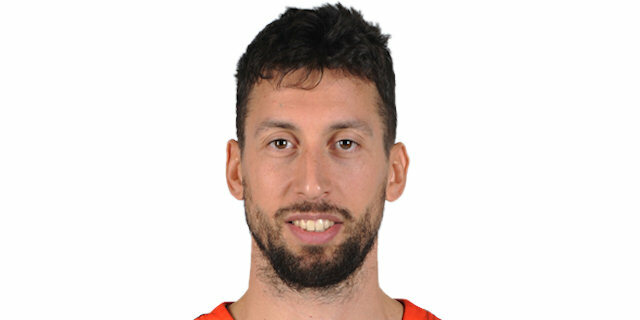 Felipe Reyes opened the second quarter with a layup, but that was the only field goal Panathinaikos allowed for more than 10 minutes bridging the first two quarters. Marcus Banks sank a triple for the Greens, and after Jaycee Carroll hit a jumper for Madrid, a reverse layup from Diamantids made it 19-23. 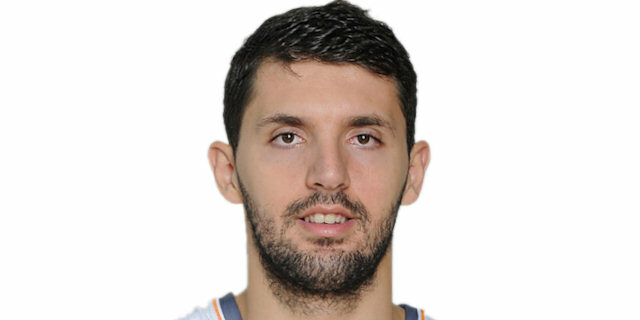 Mirotic got the hosts back within a single point by making back-to-back buckets, before Rodriguez put Madrid up 28-26 with a pair of free throws and a fast break layup. However, Tsartsaris and Diamantidis scored from downtown on back-to-back possessions, and Tsartsaris added a reverse layup for 29-36. Rodriguez answered, using a steal to make couple of layups in a span of 10 seconds, but Ukic beat the buzzer with a spin-move floater for as 33-38 halftime lead. 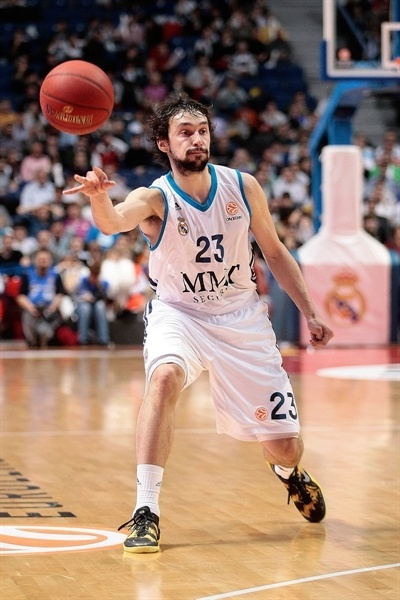 The second half started with a three-pointer from Sergio Llull, and Carlos Suarez scored inside to tie it at 38-38. After Tsartsaris made a basket from close range, teams once again went on to trade leads for the remainder of the quarter. Fernandez hit a triple of the glass for 41-40, but Sofoklis Schortsanitis replied with a basket-plus-foul. A three-pointer from Tsartsaris made it 45-46, but the hosts answered with an 8-0 run during which Carroll hit a long jumper, Rodriguez made a fast break layup, and Begic added a put-back for 53-46. Ukic, however, hit another buzzer-beater, this time an off-the-dribble-three-pointer making it 53-49 after three quarters. Jonas Maciulis got a lucky bounce on a triple to open the fourth quarter, and Llull answered with a long jump shot for 55-52. After Lasme and Begic traded baskets from close range, Gist scored a layup to help the visitors briefly go up again, 57-58. However, Madrid went on a 6-0 run during which Fernandez made a tough driving layup and added an easy one from close range, 63-58. 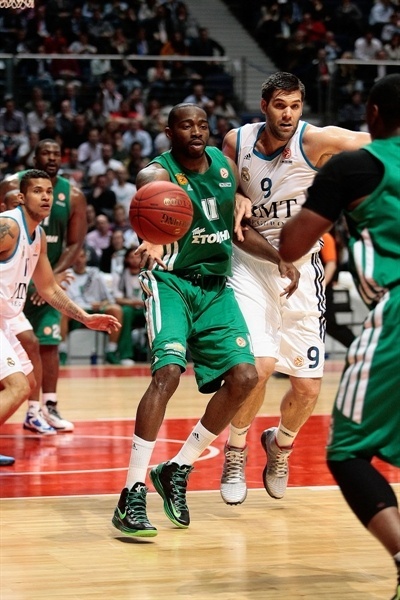 Panathinaikos replied right back with 8 unanswered points. 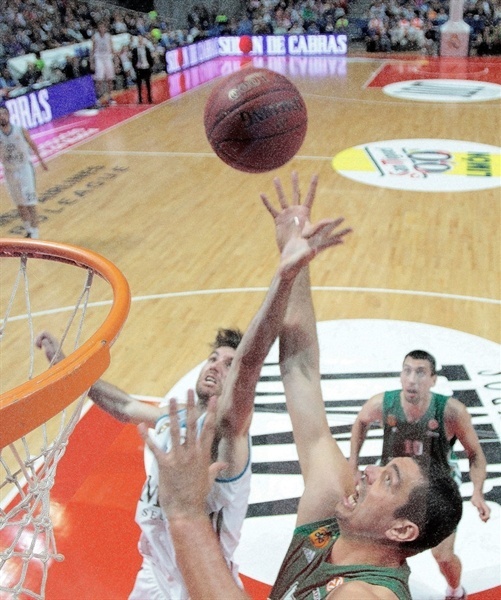 Maciulis sank a three-pointer to end the Greens’ drought, then Diamantidis followed it up with one of his own from downtown, and Ukic capped the run with a driving layup for 63-66. Mirotic got the hosts within one point with a pair of free throws and a put-back, but Panathinaikos extended the lead to 67-71 with 3 of 4 free throws from Maciulis and Tsartsaris. Madrid received a glimmer of hope after Tsartsaris and Diamantidis combined to hit only 3 of 8 free throws in the final 15 seconds, but Llull only made 2 of 4 from the foul line and all the hosts had left was a half-court game-winning attempt from Rodriguez that did not come close. "It is a weird day, I have mixed feelings. The team worked well and despite the loss, we made it to the playoffs. We are one of the best teams in Europe, which was our first goal. The team stood tall and improved in rebounds, but lacked freshness. I am not very worried because freshness will come back to us. We still depend on ourselves and have two tough games ahead of us. One of the goals was reached – reaching the playoffs. If last September someone gave us the chance to depend on our own scores to get the home court advantage in the playoffs with just two games left, we would have taken it." "It was a very difficult game, just as all the ones we played lately. We have tried to control the game rhythm and prevent Madrid from running. If they run, they beat you. We wanted to reach the final five minutes with chances to win because Madrid could put a lot of pressure on itself. We played with more patience and good defense, worked hard and an extra free throw made would have sealed the outcome earlier. The group is really open now." "It was a tough game, just as we expected. We fought hard and stood tall but we have to take into account that we faced Panathinaikos, one of the best teams in Europe. I wouldn't think we have to think too much on this loss because we depend on ourselves to achieve the goal of getting the home-court advantage in the playoffs. We lack freshness and are a bit down as a team right now, but it is better that this happens now than when there will be no tomorrow. The team wants to move on and try to beat CSKA in Moscow. It can be done and we can still win this Top 16 group." "This is a great win for us. We need one more win to get in to the playoffs. I prefer to go game by game. We played a really good game, getting back to it when we were trailing, playing well in both ends of the floor. We worked hard on some details which allowed us to stay in the game and get the win. It is very important for us to beat Real Madrid, a team that had beaten us twice. The next home game against Brose Baskets should take us to the playoffs, but even though we are the favorites, this is the Euroleague. We cannot take it for granted; Bamberg lost a lot of close games, even in overtime."